Learn all about major and minor pentatonic scales: how to identify their notes, how to play them, and easy ‘box patterns’ to remember. Pentatonic scales are widely attributed with shaping rock music. Listen to Guns N’ Roses’ Sweet Child O’ Mine and AC/DC’s Back In Black, for instance – those iconic licks are founded upon the pentatonic scale. And the ‘neutrality’ of the scale means it’s also been employed in other genres, such as country, blues and folk. However, it’s important that you’re familiar with sharps, flats and keys, and understand their role in major and minor scales. As you can tell from the name, a pentatonic scale consists of five notes (“penta” comes from “pente”, which is Greek for “five”). That means both the major and minor pentatonic scales are, respectively, a major and minor scale minus two notes. So it helps to think of them as ‘simplified’ versions that are nonetheless one of the building blocks of contemporary pop and rock. And like major and minor scales, there are formulae – based on note intervals – that you can use to derive major and minor pentatonic scales in any key. Remember the ‘whole-whole-half’ and ‘whole-half-whole’ intervals of the major and minor scale? 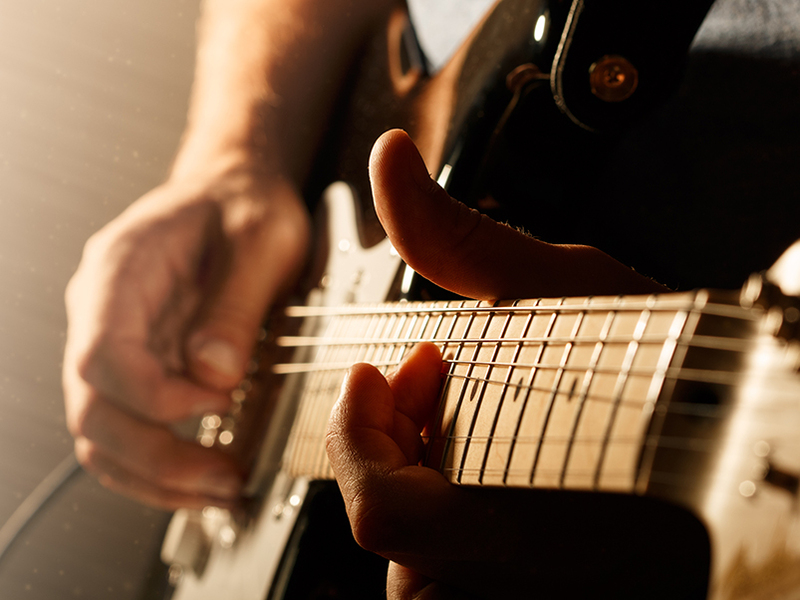 You need to commit these – or, even better, all the major and minor scales themselves – to memory before tackling pentatonic scales, because the latter rely upon them. 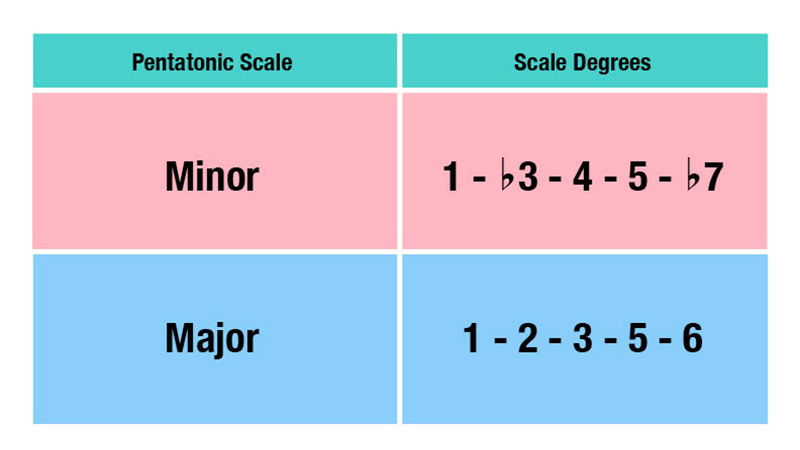 Here are the formulae for major and minor pentatonic scales. The ‘scale degrees’ refer to the notes of a major scale. As you can see, we’ve taken only the first, third, fourth, fifth and seventh notes from the A major scale. You’ll also notice that we’ve flattened the third and seventh as the formula calls for ♭3 and ♭7. The result is an A major scale without the D and G♯. Understanding these formulae is crucial as they allow you to quickly identify the notes that go into a pentatonic scale. It also gives you a deeper understanding of the scale as opposed to simply memorising patterns. While it’s important to understand the pentatonic formulae, learning the pentatonic box patterns has its merits. These patterns can be linked to the CAGED system, and just like it, they also encourage you to explore the entirety of the fretboard. In this image, we’ve retained only the chord roots, giving you a clearer picture of their positions. And here’s where the magic begins. 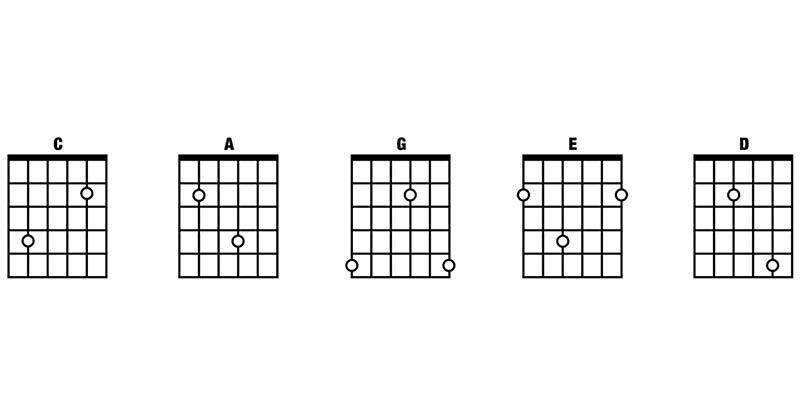 Below, we have the minor pentatonic shape patterns and their constituent intervals, and, as you can see, their root note positions match those of the CAGED images. It’s the same with the major pentatonic. 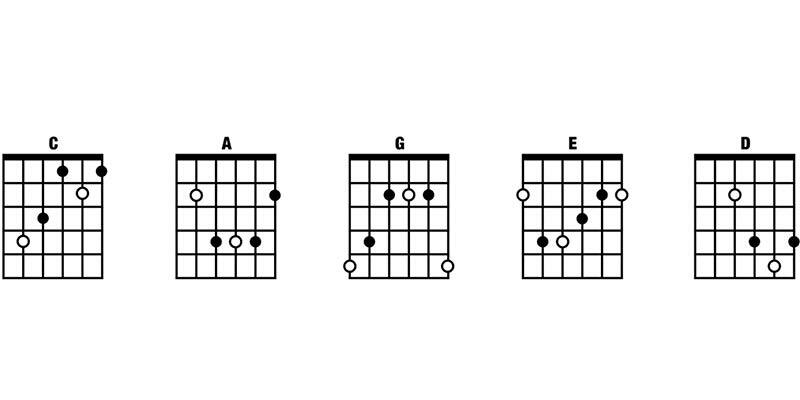 This pattern differs from that of the minor pentatonic scale, but the root positions still match those in the CAGED images. Looking at root positions this way makes it easier to remember the patterns. When you know where these roots lie, it’ll be easier to recall the scale shapes. The single-octave box pattern is another technique to learn the pentatonic scale. It’s important because, when paired with diagonal scale patterns, it allows you to traverse the fretboard with confidence. It’ll also make you a more versatile guitarist – one step closer to shredding like Slash. And the pattern below is simply multiple octave ‘boxes’ that are linked together diagonally – which incidentally forms a pentatonic scale. And once again, the multiple single-octave boxes combine to form a diagonal pattern. When moving to the thinner strings, always remember the positions of the root positions notes – you may recall an earlier lesson, in which we used ‘2,2’ and ‘2,3’ coordinates. The pentatonic scale is beautiful because it’s versatile and relatively easy to learn. Applying it isn’t rocket science, either. In a minor key, use the minor pentatonic; in a major key, deploy the major pentatonic – or its relative minor equivalent. What’s a relative minor, you ask? You’ll find the answer here.